Anthony "Romeo" Santos (born July 21, 1981) is an American singer, featured composer and former lead singer of the Bachata group Aventura. 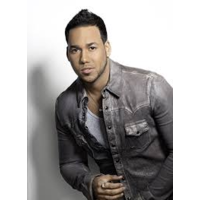 As a member of Aventura, Santos has been a key figure in popularizing Bachata, with hits reaching near the top of the Billboard Latin charts and the top of charts in Europe. In 2002, the band's song "Obsesión" was number one in Italy for sixteen consecutive weeks. Santos was born in The Bronx, New York, United States to a Dominican father and a Puerto Rican mother. At twelve years of age, he became a member of the church choir. While the group performs in both English and Spanish, their work was widely ignored by the English-language media during the early part of their career. On May 9, 2011, Santos released his first single, "You", from his upcoming solo debut album, Formula. The song became a number-one debut on the Hot Latin Songs and Tropical Songs chart. The second single revealed from his album was "Promise" which features a duet with Usher. The single has peaked at number ten on the Hot Latin Songs chart and number one on the Tropical Songs chart.